A common essential oil used in aromatherapy that has amazing health benefits. It relieves stress and anxiety, helps to reduce pain and inflammation and is a powerful immunity booster. Frankincense (Boswellia serrata)has strong anti-inflammatory properties and even may help fight cancer. It helps to reduce the side effects of chemotherapy. 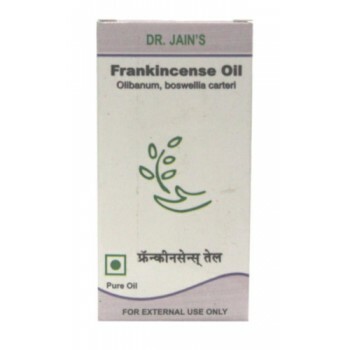 Frankincense acts as an astringent and is an antiseptic and can kill harmful germs and bacteria such as cold or flu. Studies have confirmed that Frankincense oil has the ability to smooth the appearance of healthy skin but also cures dry inflamed skin. It helps to reduce acne blemishes and scars. Healing for skin, anti wrinkle, anti inflammatory, calms mind. Mix 10 to 30 drops of aromatherapy oil in a base oil (Til oil, corn oil etc.) and massage on affected part or give full body massage. The formula can be prepared by using Dr. Jain's Aloe Vera Liquid, Aloe Vera Gel, Cucumber gel etc. Baths: Add 2 to 4 drops of aromatherapy oil in bucket warm water (app. 25 lit.) and take bath. Can add to a foot bath, size bath. An aromatherapy oil compress may soothe aches, sprains, or swelling. Take a bowl of cold or hot water as required. Add some drops of aromatherapy oil in It (1 drop to 100 ml. water). Immerse a cloth in the water, squeeze it lightly and place over the affected area for 10 minutes. Repeat the procedure 3-4 times. Use hot water for muscular aches and cold for sprains or headaches. An alternate way is to make a thick paste with wonder mitti (Dr. Jain's), add few drops of aromatherapy oil and apply thick lep on the affected area. Cover it with cloth and wash after 30 mins. For fresh and fragrant atmosphere add 2-4 drops of aromatherapy oil on the vaporizer. Also, can add to spray bottle (4 drops to 200 ml water) and spray. One can add few drops to the water used for cleaning the floor, tables, and counters. Reduce the number of aromatherapy oil drops to half or one fourth (according to age) in children below twelve years. Do not use aromatherapy oils in children below one year. Never use essential oils directly. Always mix them with base oil. Not to be taken orally. Avoid contact with eyes, genital area, and open wounds. Avoid in pregnancy, lactation, infants, and patients with epilepsy, asthma, heart problems, cancer, fever, allergy, infectious skin conditions, and post-operative period. Store in a cool and dry place away from sunlight, heat, and children. Close the cap tightly and avoid contact with water.